Siena's contrada dell'Oca (neighborhood of the Goose) has given Italy some of its most famous women. Sienese rebel Gianna Nannini is the country's prime female rock star, whilst Saint Catherine - born in the 14th century - is still going strong even today. 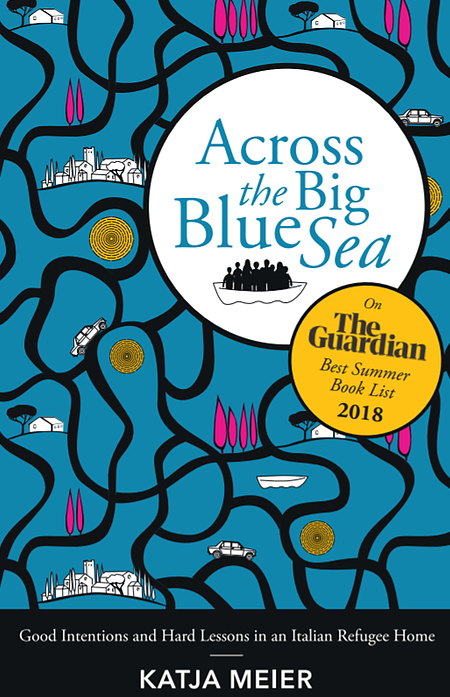 The American travel writer Susan Van Allen has written extensively about Italy from a female perspective and - no surprise - Siena and its beloved Saint are a must do on her Grand Tour for women travelling the boot. Below an account of Saint Catherine's life from the Siena chapter of Susan's "100 Places in Italy Every Woman Must See" (I've reviewed her guide book last year over here). The evening sky in Siena is a divine wonder to behold. Get a seat in the Piazza del Campo as the sun sets and you’re in for a show. Colors change from blue-pink-golden to a rich navy. Then out pop the stars. Whoever is doing the lighting here is brilliant. Any time of day, Siena is one of the most pleasant cities to stroll around. You’ll be awed by the Gothic Duomo outside and in. There’s Duccio’s Maestà (Majesty) in the Museo dell’Opera Metropolitana, where the BVM sits enthroned, holding a rose-robed baby Jesus, surrounded by twenty angels and nineteen saints. When this masterpiece was unveiled in 1311, the whole town came out with candles to ooh and aah over it as church bells rang. All over Siena, Saint Catherine, the most important woman of the Middle Ages, is honored with statues, paintings, and altars. The beloved Mystic of Politics was born here in 1347, in the area called Contrada dell’Oca, or Neighborhood of the Goose. Pilgrims flock to the church she went to while growing up, which is now the San Domenico Basilica. There you’ll find the richly decorated Santa Caterina Chapel, with frescos by Sodoma, who was a student of Leonardo da Vinci. In the center of it all is Catherine’s head. Compared to a lot of other relics I’ve seen, it looks more like a mask, in amazing shape. Her thumb is nearby under a bell jar. A short walk away is the Santuario e Casa di Santa Caterina, where the saint was born and grew up. It doesn’t look as it probably did in her day, as it’s been transformed to a shrine with Renaissance paintings that tell stories from her life. But still, as you walk through what was her kitchen and go upstairs to her bedroom you get a feel for the strong spirit of this brilliant woman. Get a load of the stone pillow she used—just one example of how she denounced creature comforts to feel closer to God. Catherine was the twenty-fourth of twenty-five children, whose twin sister died in childbirth. She shocked her parents when she was seven and announced, “I’ve had a vision! I’m devoting my life to Christ!” Her mother tried to pull her away from her incessant praying and marry her off when she was twelve, but Catherine chopped off her hair and put up a fight. Her parents finally relented, and allowed her to join the Dominican nuns as a “tertiary,” a lay person associated with the clergy. Catherine devoted herself to nursing the sick, but even the devout around her were concerned about her religious zeal, as she’d only eat communion wafers. These days, psychologists who’ve examined the lives of female saints focus on Catherine. They say she had survivor’s guilt because of the death of her twin, and it manifested as holy anorexia nervosa. Despite her diet, Catherine became a powerful, influential woman. She had a vision that set her on a path to change the world through letter-writing. This was amazing, because she was illiterate. She dictated letters to her followers, and sent them off to the Pope in Avignon, encouraging him to come back to Rome. Those fourteenth-century times were a mess with divisions in the papacy and Italy. Dante and Petrarch had written to Pope Gregory XI to try to get him to come back to Italy, but it was Catherine’s outright begging, addressing the Pope as “Sweet Babbo” (Sweet Daddy), and demanding “Up father, like a man!” that got him to think about budging. For the ultimate push, Catherine went on horseback to Avignon and had a one-on-one meeting that got the Pope to pull up stakes. He died shortly after, and Catherine joined the new Pope in Rome, continuing to fight to unite the church through her writing. She died in Rome at thirty-three, of a paralytic stroke. Catherine was canonized in 1461 as the Patron of Nurses and Fire Prevention. In 1939 she was named Co-Patron Saint of Italy (along with Saint Francis), in 1970 a Doctor of the Church, and in 1999, the Patron of Europe. The Romans treasured her and have her body enshrined in the Santa Maria Sopra Minerva church, which coincidentally has a frescoed ceiling that to me resembles the Siena sky. Her head is in Siena, because, according to legend, it was stolen by Sienese. When Roman guards caught the thieves on their way out of the Eternal City and asked them to open their sack, it appeared to be full of rose petals. But when they got it back to Siena, the head reappeared. Catherine’s foot is now enshrined in Venice, at Santi Giovanni e Paolo. Everybody wanted a piece of this amazing woman. But you’ll feel her presence living on most powerfully in Siena. 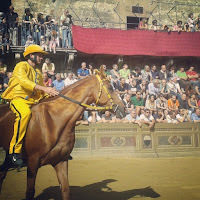 Golden Day: Enjoy Siena and Saint Catherine sights. Get to the Campo for sunset. If you don’t want to splurge at the obvious caffès, head to Key Largo, where you can walk up a narrow stairway (more like a hole in the ceiling) with your glass of wine and wind up on a narrow wooden balcony to take in the whole scene. Stay at Palazzo Ravizza, a restored Renaissance palace. Intrigued? 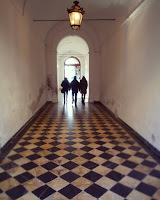 Want to here about the other 99 Italian places Susan Van Allen has written about? 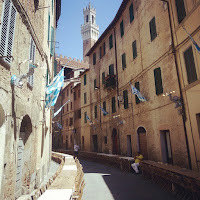 or just join her Golden Week in Tuscany tour in November.